Hard to know how to title this wine–the bottle reads simply Baby Blue but the winemaker’s website calls it Baby Blue Cabernet. Or Baby Blue Estate Red Blend. Whatever it’s called, it is fantastic. My wife picked out this crazy winner and gifted it to me for my 40th birthday. 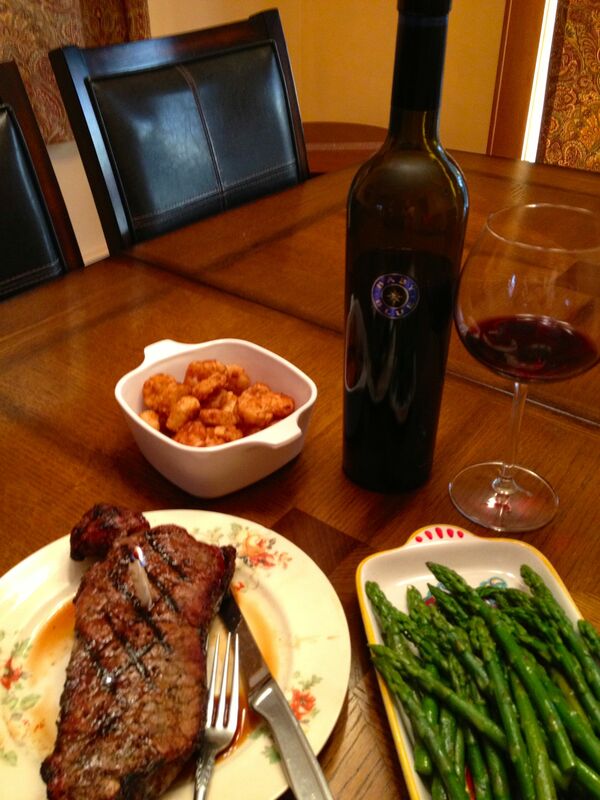 It was part of a great weekend, and we polished it off on Sunday night with a perfectly grilled steak, some delicious tater tot crowns, and grilled asparagus. Perfect pairing, in all the ways that matter to me–obvious and subtle both. The winemaker remarks further, “The wine spent 16 months in French Oak (once used) and has been bottled unfined. As a result, Baby Blue is delicious on release and is intended for mid-term cellaring.” Fans of this blog know that’s a bunch of high-falutin’ language but in the end it means one important thing–the wine is great. I’m ready for my next glass already. This entry was posted in Red blend and tagged alexander valley, USA.